This extraordinary book has a one-inch hole drilled through the exact center of each of the 136 pages. The Author uses the spatial emptiness of the void to share a profound and universal Truth that can, in fact, only be discovered within. By pointing to the empty hole on each of the pages, the Author is also pointing to the empty void in the center of you, too. A unique journey into the (w)holeness that lies at the core of Being itself. Look inside... and touch the Void. Novel, entertaining, and straightforward, Looking for God is a celebratory, uncompromising description of Source, Truth, non-dual reality. Richly illustrated with explosive lettering, and a one-inch hole (representing the Void, the Source) drilled through the center from cover to cover, this book will be enjoyed and valued by anyone driven to explore the intuition of what their true nature is." “Thank you, Chuck, for yet another totally delightful work of true spiritual genius. Looking for God is rich and full with abso-lute Truth, mature insight, whimsical serendipity, and real LOVE. My wife and I relished it completely." The bliss-void that is one with the whole universe is ever present. But this delightful and totally accessible book by Chuck Hillig makes it even more so! In Looking for God, you will discover the experience of no-thing-ness that is inseparable from everything we experience. Read it and you will be illuminated." 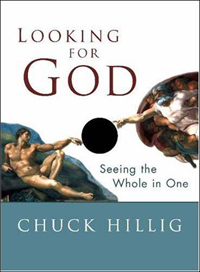 “Looking for god? Seeing the whole in one? What words are there to arise from everything and nothing to point to this pointing this non-person chuck does with this apparent thing called a book? Who am I to say? What is there to say that chuck has not said? Nothing. Well maybe this: Yes! I want to write a review but I can't think of a blessed or damned thing to say. I am left with nothing and that is all, literally that is all. That is everything and nothing expressed with wit.